Roasting is a wonderful technique for a formal dinner or a casual get-together. Watch Martha as she makes Roast Rack of Lamb, an ideal choice when you want to impress your guests. 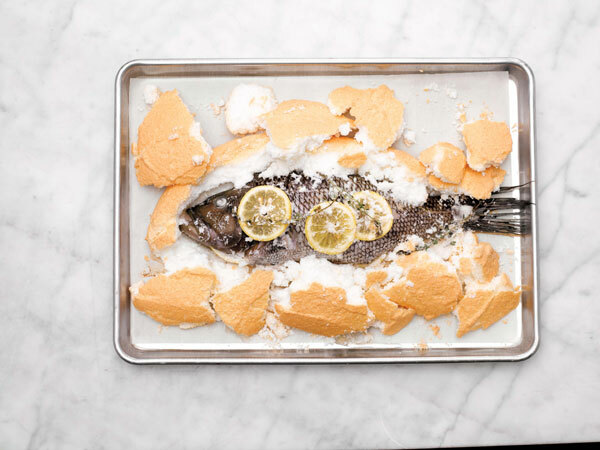 Then learn a classic Spanish technique as she cooks Salt-Roasted Sea Bass. Finally, find out how to make Saffron-Roasted Chicken Wings, the quintessential food for game day. Martha roasts spaghetti squash by cutting it in half, scooping out the middle, sprinkling with olive oil, salt & pepper, and cooking in the oven until it is tender. Then she uses a fork to easily scrape out the spaghetti like fiber. This roast rack of lamb recipe appears in the "Roasting" episode of Martha Stewart's Cooking School. Let lamb rest at room temperature 1 hour, covered with plastic wrap. Place parsley, breadcrumbs, mint leaves, lemon zest, garlic, olive oil, and salt in a food processor and pulse to combine, scraping down sides of bowl as necessary; set aside. Trim all but ¼ inch fat from lamb, then pat dry with paper towels. Season all over with salt and pepper. Heat a large (12-inch) saute pan over medium-high heat until hot, then add enough oil to just coat the bottom of the pan and heat until shimmering. Place lamb in pan fat side down, and sear until browned, 2 to 3 minutes per side. Remove lamb from pan and let cool 10 minutes. Pour off excess fat from pan. Use an offset spatula to spread yogurt evenly over browned (fat) side only, then top with breadcrumb mixture, pressing gently with your fingertips to adhere. Return to pan, coated side up. Roast until an instant-read thermometer registers 125 degrees (for medium-rare) when inserted through the eye (or midpoint of one side) of the rack, 18 to 24 minutes. Let rest 10 minutes to allow temperature to rise and juices to redistribute. Slice rack between bones and serve, with mint jelly if desired, and garnished with mint sprigs.